Genuine original Canon vs Compatible & Refill Cartridges - which should I use? There is not an actual RESUME button, so which button is RESUME referring to? my prints have started to have a green and yellow stripe through all the images but this does not happen on text or clear background. I have cleaned everything and changed all ink cartridges but still cant get it to print properly. Solution 1: You can reset the waste ink tank counter yourself. Be aware that this doesn't actually empty the waste ink tank itself (a little felt pad deep inside your printer), but it does allow you to continue printing. 2: Hold Resume button then press and hold POWER, the beeper will sound once. 5: When the indicator lights steady, press RESUME three or four times. The indicator should be orange. To actually drain the waste ink tank, you'll need to take your printer to pieces and find, clean, wash and dry the felt pads found in the base of the printer. This is a complicated procedure, but it is a good idea to do it if you're technically minded. Many people have just reset the code without actually draining the pads and very few have run into problems as a result. If you do this, you risk damaging your printer and/or the surface it sits on if the pads absorb too much ink. However, if you're going to buy a new printer anyway, you might just reset the code and stand it on a piece of paper or card. It's up to you, just understand the risks. Solution 1: This is a common issue that is largely down to personal taste. The only real way to improve (i.e. lighten) your prints is to first lighten them using a piece of photo editing software. A good choice would be Adobe Photoshop elements, but there are free alternatives. Do a google search for "Free Photo Editing Software" (there should be a google search box on this page near the top). Solution 1: There are a number of steps you can take to solve this problem (in order of easiest & least expensive first). 1. Make sure you have tried printing a nozzle check and you've carried out all the maintenance tasks that the manual alows (align print head, clean print head etc). 2. Your cartridge may be faulty. Ink cartridges that use non-genuine ink are of variable quality and you use them at your own risk. Even genuine cartridges can expire if used after the expiry date. Bad ink can clog your nozzle. It may be that you have a dried-out ink cartridge - try another one if you have one handy. 3. The print head may need cleaning. There are Canon print head cleaning kits available (use Google top right) or you could try doing this yourself - some people have had success immersing the print head (not the cartridge) in cleaning alcohol, warm water or using compressed air to gently blow through the nozzles. 4. Buy a new print head. Check the prices before you do this as (a) you may be throwing good money after bad, and (b) the price of a new printer may be the same as a new print head. Again, use Google (top right of this page) to search for these if you wish. Problem: Genuine original Canon vs Compatible & Refill Cartridges - which should I use? Dangers: Compatible/refilled cartridges vary in ink quality. Poor quality ink can dry out your print head and cause damage. 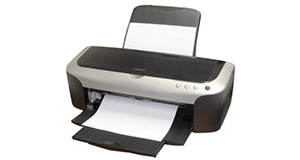 You can replace your print head, but this can cost as much as a new printer. You will also invalidate your warranty by using non-genuine ink. Benefits: Canon ink is very expensive and good quality compatible substitutes can severely cut the cost of printing without damaging your printer. - Try not to let your cartridges run dry - this can clog the print head. - Always power off the printer using the printer's power switch rather than simply unplugging and switching off at the mains. The reason is that some printers keep the ink in a ready (i.e. open) state when they are printing to keep printing time shorter. When you power off the printer, it closes the ink cover, keeping the ink tanks sealed. If you just unplug the unit, it will not cover the print head and leave it exposed. For this reason, you should restart your printer and shut it down again if you experience a power cut while the unit is on. Problem: There is not an actual RESUME button, so which button is RESUME referring to? MP750 / MP780 reset instructions..
- To select something... Use the '-' and '+' buttons and then the "OK" button. 4. Select " EEPROM CLEAR"
5. Select " INK COUNT"
6. Press the [OK] button. TIP: Don't rush the printer as it can often take considerable time to respond to your commands. Frantic button pressing will just push the printer into snail mode (ie: slow as hell!). All problems on this page have been submitted and answered by users. If you have a problem with the Canon PIXMA MP750 , please submit it below and we'll post it here. Problem: my prints have started to have a green and yellow stripe through all the images but this does not happen on text or clear background. I have cleaned everything and changed all ink cartridges but still cant get it to print properly.